Interactive, timely access to integrated Columbia Basin salmonid, environmental, hydrosystem operations, riverine, ocean and climatic data resources. Includes raw and summary data, aggregate data analysis, stock status, ESU populations, conversion rates and fish-environment exposure information. All resources are publicly available. Interactive seasonal summaries and migration performance analysis. Adult and smolt salmonid analyses include environmental exposures and passage timing, adult escapement, juvenile survival and travel time estimates, SAR estimates, ROSTER (River-Ocean Survival and Transportation Effects Routine) results, and Mid Columbia salmon status. Environmental analyses include NW temperature and ocean indices. Migration season "real time" status and predictions of juvenile and adult salmon populations run timing, adult run size, and river conditions at Columbia Basin dams. 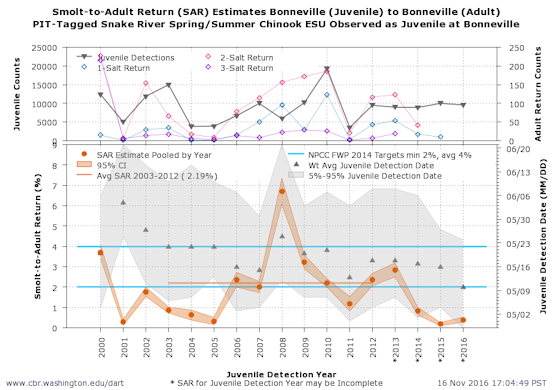 Combines real time information on status of Columbia Basin juvenile and adult salmon runs with current hydrographic information to predict future progress of fish migrating through the hydrosystem. Interactive statistical software and models for analysis of fish growth, vitality, fish passage, and parameter estimation for fish tagging studies. Downloads are available for most tools and models. CBR publications include refereed journal articles, technical papers, theses, dissertations, technical manuals, and white papers. Focus areas include mathematical ecology with emphasis on organism migration, mortality and decision processes; and mark-recapture tagging studies, primarily on salmonid stocks in the Columbia Basin. Central Valley Prediction & Assessment of Salmon. Provides modeling, monitoring, evaluation, and web-based integrated data products and services that relate fish passage to environmental conditions and provides resources for evaluating the effects of river management and environmental conditions on salmon passage and survival. Sacramento River, Central Valley Project, Delta, California. Funded by U.S. Bureau of Reclamation.